NHRA biker Eddie Krawiec is determined to ride through the 200 mph barrier. Perhaps as soon as this weekend in Gainesville. Krawiec clinched his fourth NHRA Pro Stock Bike championship last Nov. 12 during the season-ending Auto Club NHRA Finals at Pomona, Calif. Krawiec again will be aboard a Vance & Hines Screamin’ Eagle Harley-Davidson Street Rod during the 16-race PSM portion of the Mello Yello Drag Racing Series schedule beginning with today’s 49th annual AMALIE Motor Oil NHRA Gatornationals. Hector Arana Jr. holds the PSM national speed record at 199.88 mph, set aboard his Lucas Oil Buell during the 2015 NHRA Four-Wide Nationals at zMAX Dragway in Concord, N.C., on April 2, 2015. Krawiec’s victory in last year’s Gatornats was his second in a row and made him a five-time event winner. Tony Schumacher (Top Fuel), John Force (Funny Car) and Shane Gray (Pro Stock) also emerged as champs last March of an event that will be televised on FOX Sports 1, including finals coverage on Sunday at 7 p.m. (EDT). Krawiec, who dominated the six-race Countdown to the Championship playoffs en route to his fourth title, fully is aware PSB continues to add to its depth-of-field. In addition to H-D teammate/five-time world champion Andrew Hines, the field in Gainesville will feature three-time world champ Angelle Sampey, 2016 world champ Jerry Savoie, two-time world champ Matt Smith, Arana Jr., Scotty Pollacheck, Karen Stoffer and Joey Gladstone. “I only see this class getting tougher and you need to perform at that high level if you want to stay at the front of the pack,” said Krawiec, who has accumulated 43 career national event Wally Trophies. “There’s 15-16 bikes that could be in the top-10. There’s really good bikes at every race and you’re going to have to be on your game. You have to elevate the way you race. Krawiec won four Countdown races and five of the final seven events in 2017, posting a 24-2 won/loss record in eliminations during that span. A former track manager at Old Bridge Township Raceway Park in Englishtown, N.J., Krawiec termed last season his finest in a professional career that began with a three-race schedule in 2004. 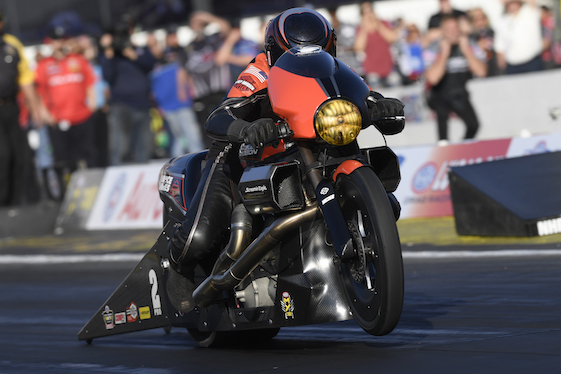 Krawiec clinched his fourth championship, and first since 2012, by qualifying on Day 2 of time trails Saturday at the season-ending NHRA Finals. Krawiec’s seven victories included his second at the prestigious Chevrolet Performance U.S. Nationals in Clermont, Ind., over Labor Day weekend. Krawiec exited the Countdown-opening NHRA Carolina Nationals at zMAX Dragway on Sept. 17 with the point lead and never faltered. “This championship, one of the most unique things about it, was the fact that I think our team was a little more united, had a greater effort to get there,” Krawiec said in a post-season interview. “What I mean by that is, we switched motorcycles after the third race of the year, going into the fourth race of the year. We made the big change. We basically introduced a whole new motorcycle, being the Harley-Davidson Street Rod (in place of the V-Rod). Krawiec said the experienced brain trust at Vance & Hines factored that into the decision to change its complete racing package. “It really made us dig deep and look at areas of our motorcycle when we were struggling with the chassis setup,” Krawiec said. “It made us dig deep and look for areas of the motorcycle that we usually wouldn’t look at because we’ve had success. Then when we actually switched back because our (new) chassis didn’t work; we switched back to our old chassis with the new Street Rod bodywork on it. It really showed us how to refine what we had and made us just that much better. Krawiec admitted the team owned by the legendary tuning duo of Byron Hines and Terry Vance was guilty of a bit of Harley hubris when it switched to the Street Rod package. “Absolutely. I mean, to be quite honest, we thought it was going to be easy,” Krawiec said.”We’re going to build this new bike, we’re going to go race it, we’re going to have great success. Well, it proved us wrong. It humbles you is probably the best way to say it. Don’t get me wrong, we had a great year. We had good success with that motorcycle. We just didn’t have the success that we wanted. It won a race. It actually won Denver (at Bandimere Speedway in Morrison, Colo.), which is one of the hardest races to go and compete at (because of thin air). But it also takes a different level running up there. You have to have a different understanding of how to tune the motorcycle and a way different approach. Work on the new chassis continued last season, however, including a test after the Countdown race at The Strip at Las Vegas Motor Speedway in late October. “The bike ran well. We figured it was a great opportunity to run it in Pomona,” said Krawiec, referring to the season-ender at Auto Club Raceway. “We actually brought aboard a third rider, Chip Ellis. It was kind of perfect timing. Unfortunately, Chip was racing for Junior Pippin, who just passed away. We wanted to bring Chip aboard for two reasons _ one, to gain some data and information, and the other to do a little bit of a tribute to Junior Pippin Racing, because his program had to stop and get put on the side while they tended to Junior’s health conditions. Really we wanted to try to end the year and put a smile on his face. Krawiec begins the season third on the all-time Pro Stock Motorcycle win list, trailing Hines’ five titles and the six racked up by the late Dave Schultz between 1987 and 1996. Krawiec also is among a handful of NHRA competitors to have won four championships, an exclusive club featuring Don “The Snake” Prudhomme and Kenny Bernstein (Funny Car) and Greg Anderson and the late Lee Shepherd (Pro Stock). “To be totally honest about that, you’re talking to a guy that when I came aboard to the Vance & Hines Harley-Davidson team back in 2007, I had a goal,” Krawiec said.”My goal was to win one Wally. Really my inspiration for Pro Stock Motorcycles started in 1995 when I met Dave Schultz in Englishtown at the Summernationals. I delivered a package to him. I came to his trailer, dropped off a package, because I used to work at the racetrack there at Raceway Park. When I wasn’t racing or when I wasn’t there hanging around, I would help out at the Summernationals. I helped guys delivering packages because I knew who a lot of the drivers were. “I brought a package to Dave, spoke with him for a little while. Became a huge fan of Pro Stock Motorcycle. Actually after that weekend I went out and bought a street bike and turned it into a race bike. That’s when I started my racing career on motorcycles. “Dave went on, won that race. When Dave passed away (from cancer in 2001), I actually became a family friend of Dave’s wife Meredith and his son. When Dave passed away, I got a box delivered to Englishtown, didn’t know what it was. I opened it up. It was Dave’s 1995 Summernationals win Wally. His wife sent that because she knew it meant something. I always had it on my desk. It always sat in my room, on my desk, it was a reminder. Krawiec rode a pair of runnerup results to a seventh-place point finish to qualifying for NHRA’s inaugural Countdown field as a Harley-Davidson rookie in 2007. Eddie followed that with his first PSM world title in 2008, when he parlayed four runnerup finishes to become only the second competitor and first since Top Fueler Rob Bruins in 1979 to capture a championship without winning a race. Krawiec took care of that blank space on his resume with a victory at Atlanta Dragway in 2009, the first of a then-career-high five wins in 11 final rounds. He won more rounds that season (46) than in the previous two seasons combined. Krawiec secured his second championship in 2011 with four victories and a 35-12 won/loss record that included a pair of Countdown Wallys and 16-4 playoff mark. Eddie’s third title in 2012 was more impressive, highlighted by a nine wins in 17 races including three-of-six in the Countdown, three playoff runnerup results and a massive 50-7 overall won/loss mark. Krawiec’s next win will tie him with Schultz at 44 overall and place him firmly among NHRA’s top-15 all-timers. “Coming back at the end of it, to say you have 43 (wins), fighting to be one of the top finishers ever with Wallys in Pro Stock Motorcycle, four championships later, it just blows my mind,” Krawiec said. “To be on a list of individuals like that, it’s very humbling. The Gatornationals also is the season-opening race for the E3 Spark Plugs NHRA Pro Mod Drag Racing Series presented by J&A Service. In addition, the schedule features competition in the NHRA Lucas Oil Drag Racing Series as well as the Mickey Thompson Tires NHRA Top Fuel Harley Drag Racing Series. Professional qualifying will open with rounds at 1:15 and 5 p.m. (EDT) Friday, with the final two sessions Saturday at noon and 3 p.m. Final eliminations are scheduled for 11 a.m. Sunday.